I feel that I owe you a bit of an explanation. I didn't cook Thanksgiving dinner this year. On Thanksgiving. On Thanksgiving, I indulged in an incredible feast at The Biltmore Estate in North Carolina. It was heavenly. There were ice sculptures and two kinds of soup and four kinds of meat and seven kinds of southern vegetables (which means that all of them were incredibly delicious and none of them were in the least bit good for you) and twelve kinds of dessert. After we could eat no more, the family and I rolled outside and walked for four hours through the beautiful grounds. We walked through the formal gardens and through the conservatory and down a long path that led to a private fishing pond which flowed out by way of sparkly waterfall. That is what we did on Thanksgiving. In exchange for Thanksgiving without football, I promised my husband that on Friday, I would cook a 22-pound turkey. It's not that we needed another feast, it's that we needed the day-after food: Turkey sandwiches. My husband waits all year for a good turkey sandwich. To him, the day after food is almost better than Thanksgiving itself. 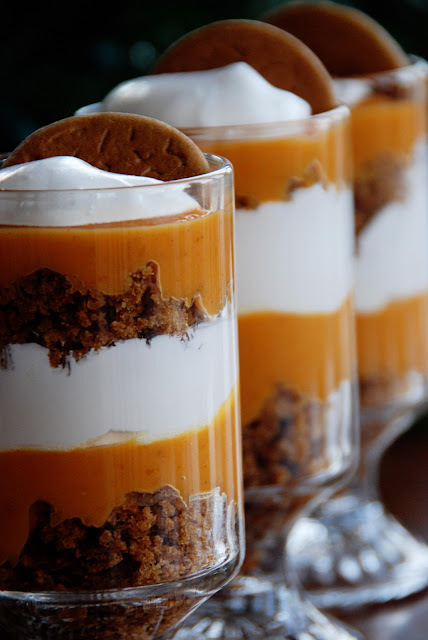 To go along with our turkey sandwiches, I decided to forego the traditional pumpkin pie and whipped up these cute little Pumpkin Gingerbread Trifles instead. They were great for (the day after) Thanksgiving, but with the gingerbread, I thought they would work equally well for Christmas, too! The great thing about preparing them in individual cups is that the beautiful trifle bowl doesn't look half-eaten after the first serving is scooped! Bake the gingerbread according to the package directions; cool completely. Meanwhile, prepare the pudding and set aside to cool. Stir the pumpkin pie filling, sugar, and cardamom into the pudding. Crumble 1 batch of gingerbread into the bottom of a large, pretty bowl. Pour 1/2 of the pudding mixture over the gingerbread, then add a layer of whipped topping. Repeat with the remaining gingerbread, pudding, and whipped topping. Sprinkle the top with crushed gingersnaps, if desired. Refrigerate overnight. Trifle can be layered in a punch bowl or layered in individual cups as shown above! Looks amazing, as always, Rachel! I particularly LOVE the idea of individual servings, as I agree with you that the large bowl trifle always looks a bit sad after the first few servings are scooped out. These look beautiful! I'm the same way - no matter what I have to make Thanksgiving. It's all about the leftovers!! 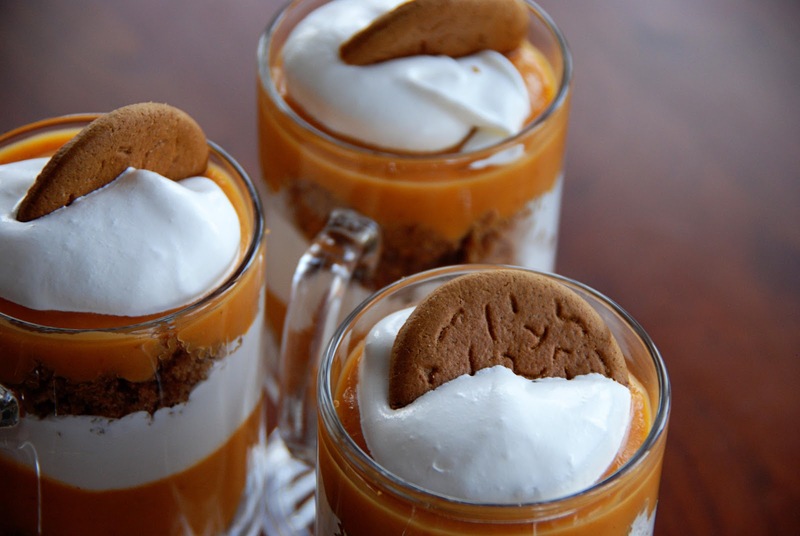 Found you on Miz Helen's...these look like PURE pumpkin perfection! I love this idea ... very pretty and very yummy sounding! It would be an excellent finish to a dinner party! Rachel, this is a fantastic dessert! Going to make it over Christmas. Thank you! 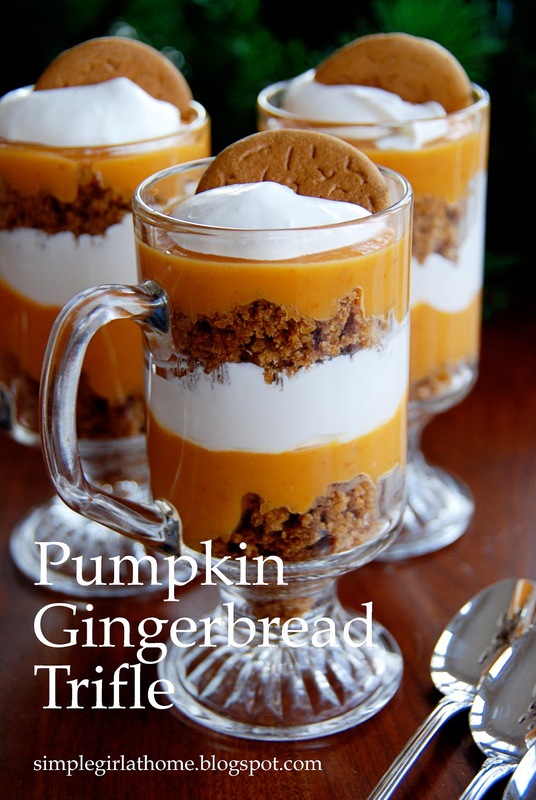 What a lovely presentation for you Pumpkin Gingerbread Trifle. This recipe looks delicious! Thank you so much for sharing with Full Plate Thursday. Hope you are having a great week end and come back soon! Oh those look incredible! I love Pumpkin anything! It's a great idea and it looks very tempting! These look beautiful! I would love someone to serve this to me. 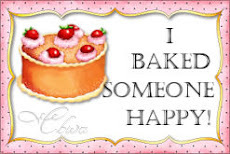 Thanks for sharing on Sweet Indulgences Sunday. You made those? Oh my goodness, yum! These trifle's look and sound amazing. 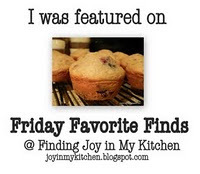 I would love it if you came to link to my holiday recipe swap blog hop. It is my first ever! Love these recipes. Sounds wonderful! Definitely pinning this and sharing it on my facebook page! 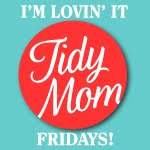 Stopped by from Made By You Monday! I love to make this recipe - easy and definitely a crowd pleaser! I like to replace the whipped topping with bourbon whipped cream when I make it. This is a new recipe for me, and I can't wait to give it a try. How can you miss with gingerbread and pumpkin! Oh my gosh- DIVINE! And your pictures are gorgeous! 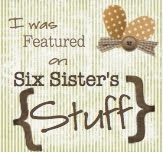 Thanks so much for linking up to Strut Your Stuff Saturday! We hope that you will join us tomorrow!